Choose the security of craftsmanship, choose KTTC! 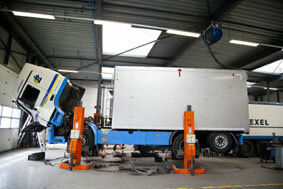 KTTC (Kraker Truck & Trailer Care) repairs, revises and maintains trucks and trailers of all brands. A team of 20 skilled, knowledgeable specialists are available to ensure that your vehicle fleet is in optimum condition, ensuring unexpected downtime to be reduced to a minimum. KTTC is also the perfect partner for repairs and Periodical Car Inspections. The activities are, thanks to the experience and knowledge of the staff, carried out quickly and efficiently so that your vehicle does not remain stationary any longer than absolutely necessary. KTTC specializes in moving floor trailers and conveyer belt bulk trailers. KTTC is also ready to provide you with service for all other trailers as well as trucks of all brands. Please feel free to contact us. Our team is at your service. At KTTC your vehicle is in the best hands!